This year marks the 28th edition of the Monaco Yacht Show. We focus on our top 5 choices among 125 world’s finest Super-yachts that were on display including 40 world premieres meeting in the Principality of Monaco’s emblematic Port Hercules. With a combined value of over 3.3 billion euros, this year’s Yacht Show featured yacht Owners, future super-yacht purchasers or charterers, decision-makers in the yachting and luxury industries who all gathered to celebrate the quintessence of the super-yacht lifestyle. “The Monaco Yacht Show has a worldwide reputation for the exceptional quality of the collection of super-yachts on display each year. About sixty of the yachts exhibited are less than two years old,” explains Gaëlle Tallarida, general manager of the show. 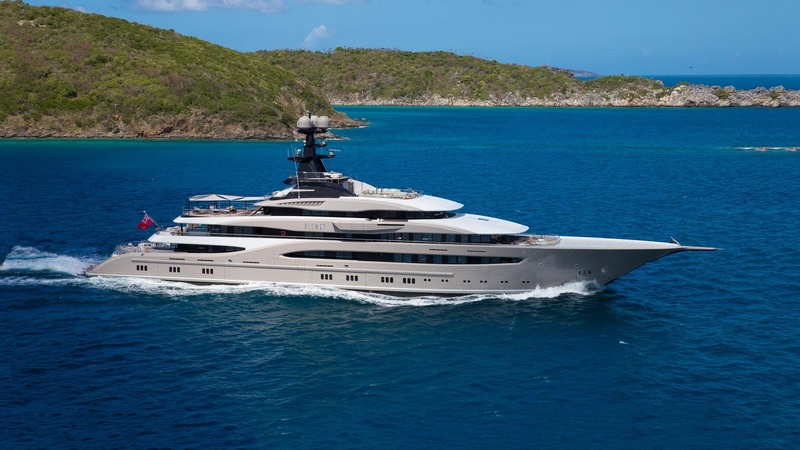 The 312′ (95.2m) Lurssen luxury yacht KISMET, built in steel and aluminium and delivered in 2014 to a design by Espen Oeino, she has a breathtaking interior by Reymond Langton featuring only the finest of materials including rare woods, fabrics and marbles. A vast saloon has comfortable overstuffed settees, a bar and sophisticated home cinema and entertainment system. Notably, a formal dining room has seating for as many as 18 guests while there are two further covered dining spaces for more casual meals. Relaxation spaces are vast with a sundeck offering a large swimming pool while elsewhere guests can enjoy a full-service spa, gym, winter garden and tractable outdoor fireplace. Having been run as a highly successful charter yacht since delivery, there is also a large selection of water toys, including Jet Skis, paddleboards, Seabobs and tenders. Powered by 2 Caterpillar 3516-C diesel engines, Kismet can reach a top speed of 17 knots. Featuring accommodations for 16 guests in 8 staterooms including a master suite with a private deck complete with Jacuzzi and helipad access. There are also cabins for 20 crew onboard. KISMET is one of the most desired charter yachts in the world today and now also for sale. The 301.84ft /92m Custom motor yacht ‘Aquarius‘ was built in 2016 by Feadship. Exemplifying the exceptional standards of construction and craftsmanship for which Feadship is so renowned, AQUARIUS is custom designed for long-range worldwide cruising in an environment of relaxed and contemporary luxury. Exterior and interior design by award-winning Sinot Exclusive Yacht Design in close cooperation with Wynn Design & Development. Impressive interior volumes and floor-to-ceiling windows throughout, offer panoramic sea views offering a new dimension to superyacht living. The yacht features a dedicated Owner’s penthouse deck, incorporating a private aft terrace, media room and vast stateroom with his and her bathrooms and dressing rooms. Unusually, the 6 large en-suite VIP guest suites are all positioned on the main deck. 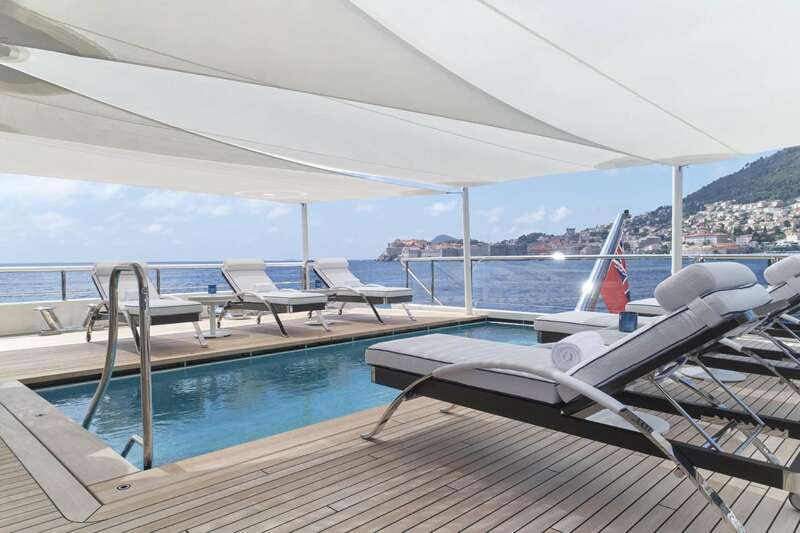 A large swimming pool is located on the main aft deck, while the expansive well-executed sun deck provides the ultimate outdoor space. The sea-level beach club leads to a spa area housing a guest gym with fold-down terrace for al fresco workouts, a massage room and beauty salon. 2 substantial tenders are stowed in the tender bay which has gull-wing doors on each side of the hull. A helicopter landing pad is situated on the foredeck. AQUARIUS’ pedigree credentials combine impeccable engineering with outstanding design, resulting in a state-of-the-art superyacht of the highest calibre available. Cloud 9 is a 74m motor yacht, custom built in 2017 by CRN in Ancona, Italy. 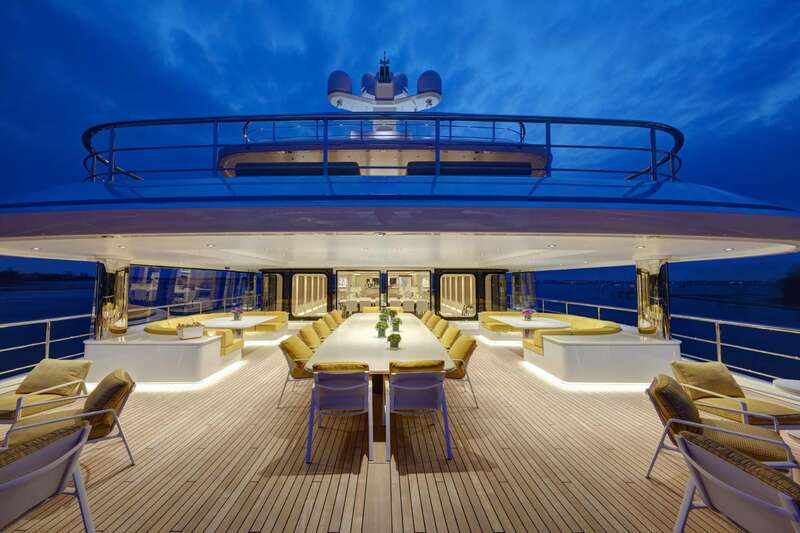 The yacht’s interior designed by Winch Design and has exterior styling by Zuccon International Project. This spectacular, award-winning yacht is an exceptional addition to the sales market. With an impressive interior volume and extraordinary comfort with over 5 expansive decks, this superyacht offers every conceivable luxury amenity available. Special features include an Owner’s private deck, 10,000 litre swimming pool with a glass bottom on the aft deck, an enormous beach club area with espresso bar, jacuzzi and Teppanyaki bar on the sun deck. In addition, luxurious facilities on board include a spa with massage area, indoor and outdoor cinemas and an elevator. This year Royal Yacht Brokers presented our exclusive sales Central Agency sailing yacht ROX STAR. Launched in 2015 and designed to be the best in luxury design, ROX STAR’s unique and stunning interior by K-Architectes, is contemporary yet rock n’ roll with touches present throughout her artwork, furniture and various fittings. The full-beam main living area offers a welcoming bar area for a refreshing cocktail before taking a seat in the dining area which comfortably accommodates up to 10 guests. An elegant skylight makes the living areas extremely luminous. Accommodating up to 10 guests in 5 elegantly appointed and spacious cabins, the master cabin is equipped with a traditional steam Hammam all refurbished in marble, to offer an amazing atmosphere of well-being and relaxation. ROX STAR flies more than 600 square meters of elegant black sails complimenting her all black hull and offers high-performance sailing even in light wind conditions. Should the wind diminish, her 2 powerful engines allow for comfortable economical and stable cruising. Riva 110’ Dolcevita immediately captivates the gaze, which sweeps along of the hull characterised by a combination of aesthetic rigour and sportiness, with a design enhanced by shaped glass windows and chrome inserts. Of particular impact is the expansive hull glazing with integrated portholes and, on the deck, the floor-to-ceiling windows that extend the entire length of the saloon, made of glass panes framed by a steel structure: a true crystal palace on the sea. “‘Dolcevita’ indicates a period and a style that could only be associated with a yacht of unrivalled beauty, one whose appeal will resonate in the yachting world for decades to come,” commented Alberto Galassi.